In this episode, we are once again joined by our co-host, Kate , who is the co-founder of Fat Free Media. Our guest on the show today is Harry Gordon, who joins us to discuss what it means to truly influence and change society for the better. Harry is a senior developer in an agency in Edinburgh and has recently started a group called Carers in Tech. In our conversation, Harry shares how suddenly becoming the sole carer for his younger brother impacted his view of work and eventually led to his desire to bring the conversation about the need for part time and flexible working out of the shadows. Here on the show, we feel very passionately that focusing on the time we put into work, rather than the actual value and output of our work is bad for us individually, for our businesses, and our industries as a whole. Our discussion focuses around exactly this principle, and both Harry and Kate make some excellent points and use powerful language that really helps to bring light to this issue and what we can do to change it in our spheres of influence. So if you want to know more about this, listen in to this episode to hear Harry’s calls for all of us to make work, and our society as a whole, a better place. Harry is a software engineer with nearly 10-years in industry working across the technology stack. In the last few years Harry became guardian to his teenage brother and is slowly adjusting to being a single-parent in tech. 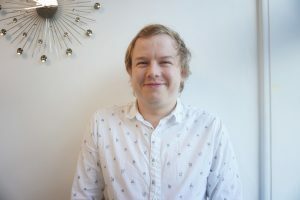 With a new found interest in work-life-balance Harry has started a community called Carers in Tech to facilitate discussion and hopefully find a way towards a more compassionate industry. Harry’s journey of being sole guardian of his younger brother. Why Harry had to leave his position at his company after going part-time. Realizing the difficulties of finding part-time work. The motivation behind Harry launching the group, Carers in Tech. Recognizing that the “hustle” is no longer okay. The common themes coming out of Harry’s Carers in Tech group. Why part-time work should be an option everyone has access to. Challenges with a time-based pricing model when it comes to part-time work. How a full-time requirement is limiting diversity in the workplace. Strategies for starting the conversation around introducing part-time positions.